At the institute we take advantage of holidays (Sukkot was this week) and go on overnight hikes! We headed down to the Eilat mountains and camped overnight, going on a nice full moon-lit night hike around 10pm with a ridiculous amount of light. The first two pictures attached are from our early morning sunrise hike when we reached the summit. The words written in stone are “Makhon Arava.” The spelling of “Makhon” was debated as it’s a hebrew word so writing it with our alphabet doesn’t quite translate correctly. In the second picture, you can see me and my friends who all bravely ignored the path and just climbed up the side of the mountain to get to the top before the rest of the group. 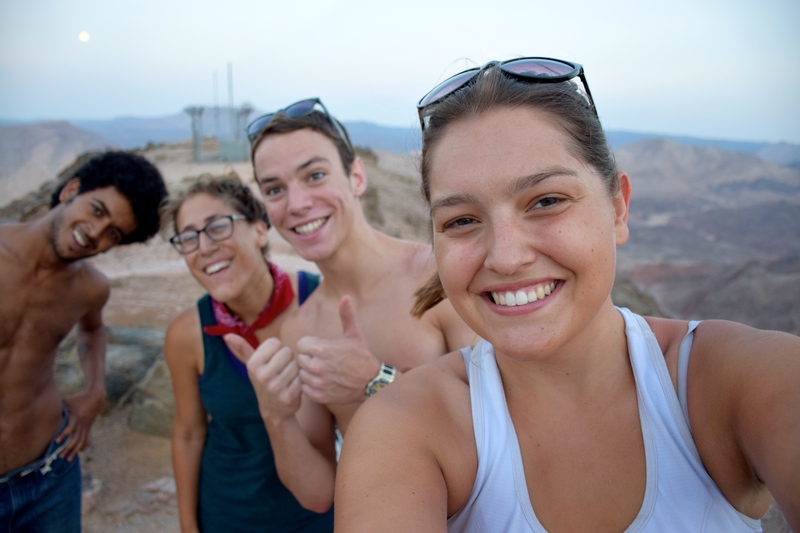 After we hiked down to Eilat we spent the day hanging out, swimming in the Red Sea, and ignoring our tiredness and aching muscles. We headed back to the kibbutz around 1pm, well most of the group did, Antoine and I stayed behind to get lunch in Eilat (which was guaranteed to be better than lunch at the Kibbutz) and ate at Pizza Hut. When we did finally arrive back at the kibbutz we all were afforded short naps before dinner and a performance by a rather famous Israeli singer, Achinoam Nini, if you have seen La Vie et Belle than you might know her as the singer of one of the main songs from the movie. 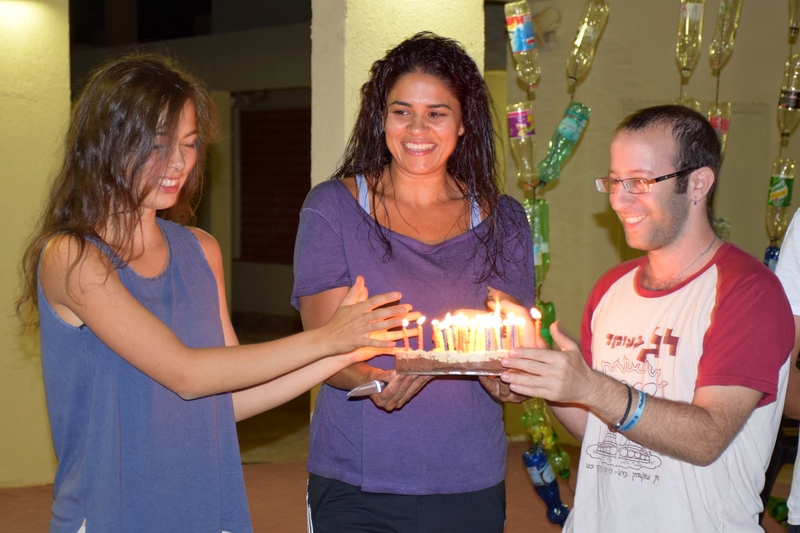 She recently joined the board of the Arava Institute and was performing at the kibbutz for us. I totally loved her, she has a beautiful voice and her songs are incredible. 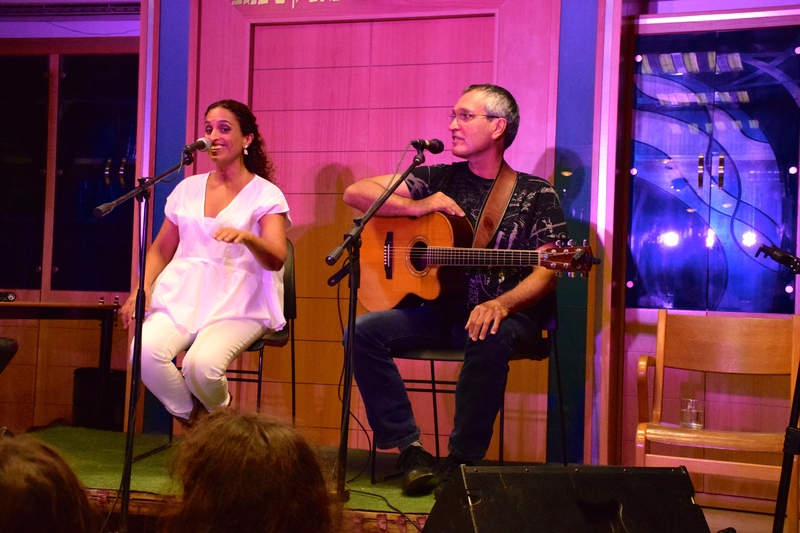 This is Achinoam and her guitarist, Gil, singing in the kibbutz synagogue which is across from our class room. The next day when Achinoam came to the student lounge and chatted with us for an hour or so. She wanted to meet us and hear about our experiences at the institute etc. etc. We all wished we had more time to chat with her 1 on 1 and that she’d sing some more because she has a beautiful voice, but, c’est la vie. None of us got our wishes. This is a hike my friend and I went on today. I’ve been hiking almost everyday for the past week and it’s been awesome. The route we took on this trip was one we hadn’t done before, we’d heard of a place called Crystal Canyon and we found it! That’s where this picture was taken, in addition to the new route I’ve acquired a nice collection of quartz and other cool stones from the canyon. Yesterday was one of our PA’s birthday so we (and by we I mean one of the PA’s who is an amazing baker) baked her a cake and the students wrote a song and sang it to her, accompanied by one student on guitar. #datkibbutzlyfe: This time of year is filled with many holidays, beginning with Rosh Hashanah, then Yom Kippur, Sukkot and next week we’ll be celebrating Simchat Torah. This part of the year is filled with festivities similar to Christmas/New Year’s in the United States. Rosh Hashanah is the Jewish New Year and we celebrated with two days of Shabbat-like dinners in the dining hall and celebrating the year to come. Within the Makhon we discussed goals we had for the upcoming year and tied wishes to the trees that we hoped would come true over the year. The other side of Rosh Hashanah is Yom Kippur, this comes after Rosh Hashanah and is a day of reflection on the past year. Traditionally this is a day for you to offer and receive forgiveness for wrongdoing over the past year. One of our PAs vocalized the link between the two holidays as Rosh Hashanah coming first, letting you celebrate the new year, with the idea that you will reflect on the old year afterwards. Letting you celebrate with the promise to yourself that you will think back on the past year. Yom Kippur is generally a somber day of reflection with a twenty five hour fast. Many of the Jewish students took the day to themselves and fasted out in the desert or in their rooms. I decided not to fast, knowing that I don’t handle being hungry very well. Sukkot occurs every year five days after Yom Kippur. What happens is every family create a sukka to live in during the Sukkot holiday. A sukka is a three walled structure with palm leaves or some other organic matter for the roof. The idea is that you “live” in the sukka, or at least eat and sleep in it. On the kibbutz each family can build their own sukka near their house to sleep in, I stumbled across a few sukkas built in the desert that people intended to sleep in. In addition to this, the entire dining commons is moved outside to a sukka that is built right next to it. The kibbutz members created decorations to hang in the sukka and we’ve been eating out there for the past few days. I’ve heard a few variations of the meaning behind Sukkot; one is that Sukkot is there to remind you that you have no possessions and that God takes care of you (shown by the fact that you’re living in your sukka with no possessions for a few days). Another meaning for Sukkot is that it reminds you the importance of family because you’re all living in a sukka together with no distractions so it brings the family closer during this holiday. 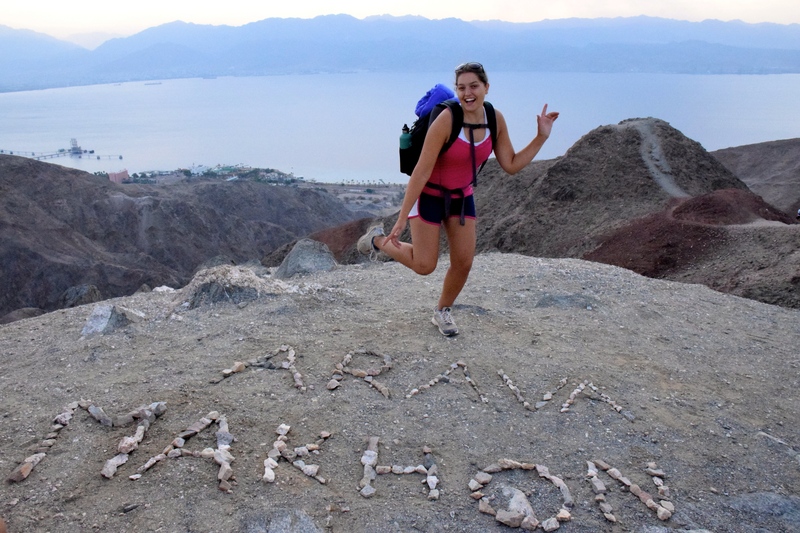 #datkibbutzlyfe: Fun story about the word Makhon! 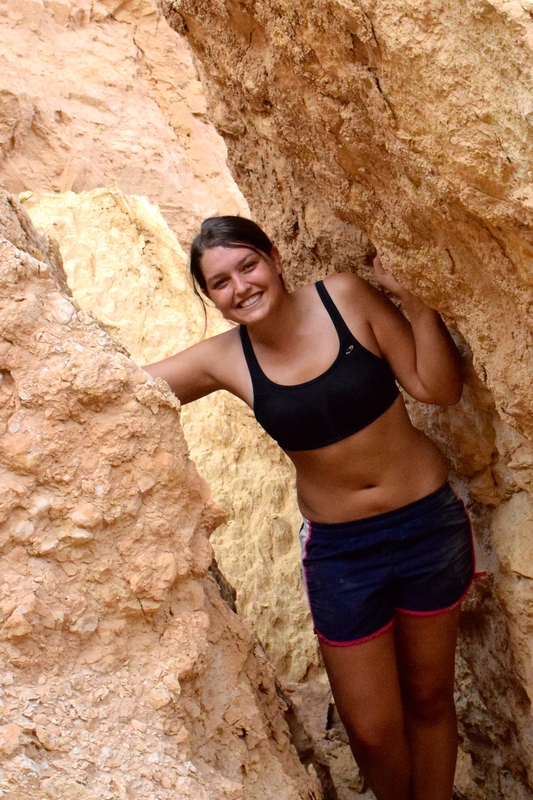 When we first arrived at the kibbutz the staff referred to the Arava Institute as the Institute for the most part, but gradually, as time went on (by which I mean like three days in) everyone stopped saying Institute. Then I would hear all of the stories about things happening at the “Makhon” or when they were at the “Makhon” and I had no idea what a “makhon” was. Finally, in the middle of a get-to-know-you exercise, one of the PAs was telling her story and continually referring to the “makhon” so I raised my hand and asked what in the world “makhon” was. She began to laugh and apologized, not realizing that they had never explained to us what makhon meant. Makhon is the hebrew word for Institute and around the kibbutz we are often referred to as the makhon. Not only did this clear up a lot of things people from the Institute were saying, but we now could listen in to conversations in hebrew and see if they were talking about us!